Hiawatha Island… The name alone brings to mind a land of legends and visions from a long-ago era. Did the legendary Hiawatha ever frequent its shores? Not likely. But, it is believed the Iroquois nation once used the island as part of their homeland. Artifacts found in its soil from bygone eras have been donated to the collections at both Binghamton University and the Tioga County Historical Society museums. The Big or Great Island, as it’s been called, comprises 112 acres in a beautiful tranquil setting. A few miles east of Owego proper, it’s surrounded on all sides by the Susquehanna River flowing west. Once a bustling retreat for locals and tourists alike, it contained a beautiful three-story hotel and meandering sylvan paths with the island’s dock reached by steamboats throughout the summer months. Earliest records for the island note that Britain’s King George III issued a mandamus (a writ directing a lower court to perform a specific act) dated January 15, 1755, deeding land, including the island, to the Coxe family in exchange for their territory in Georgia, the Carolinas and the Bahama Islands. By 1821, the Coxe family had surveyed and divided the land into small farms with the Big Island designated as lot no.120. This is where due diligence pays off in checking all genealogy sources yourself. The person filing that family paper did not reply to my inquiry in 2002. Digging deeper, I found and purchased a McNeil family history from the Montgomery County Historical Society in Fonda, NY simply to see if that family held clues to my own. However, that historical writeup is about the family of John and Ruth McNeil of Vermont who lived in Fulton, NY, with that genealogy listing a daughter Ruth who the researcher was unable to trace further. From personal extensive research on my own McNeill family, it is proven that John C. McNeill and Hannah Caldwell married May 8, 1781, that their first daughter, Betsey, was born December 5, 1781, and that she was adopted by Hannah’s childless older sister, Elizabeth. In checking late 19th century census records for Matthew and Ruth LaMonte’s children, they note their mother was born in NY, not NH. With the above John and Ruth McNeil’s family history listing a child named Ruth of whom nothing more was known, I felt there was sufficient circumstantial evidence for Ruth (McNeil) Lamont to be their child rather than a daughter of my John C. and Hannah (Caldwell) McNeill. Furthermore, John C.’s family did not contain the name of Ruth in any older or younger generations as does the Vermont McNeil family. Of additional interest, my earliest ancestors and their descendants consistently spelled their name McNeill while John and Ruth’s descendants consistently used McNeil. 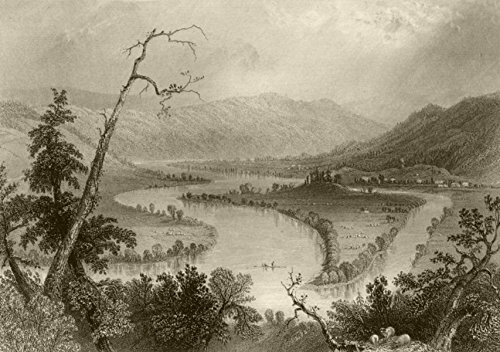 Matthew and Ruth LaMonte removed from Schoharie County to Owego, Tioga County, NY in the early to mid 1820s. The second registered deed to the Big Island, dated June 23, 1830, is to Matthew and Marcus LaMonte. Matthew was the husband of Ruth above. Their son Marcus had at least three children: Abram H., b.1831 on the island, Susan Jane b. 1834 (as a teacher, one of her students at the Owego Academy was the young John D. Rockefeller), and Cyrenus M., b.1837. Cyrenus purchased the Big Island in 1872 just before its commercialization commenced in 1874 with picnics and summer events. The earliest known birth on the Big Island was that of Lucinda (Bates) Lillie, born August 16, 1800. It is also known that various squatters took up residence on the island, particularly when owners were absent, making good use of the fertile river-loam farmland. Another tie of note to the island is that of Ezra Seth Barden who was born in 1810 at Lee, Massachusetts. In 1833 he brought his young bride, Catherine Elizabeth Jackson, to Owego where they set up their home on the Big Island. She just happens to be a second cousin of U. S. President Andrew Jackson. The LaMonte family had their main farm directly north of the island where Rt. 17C runs near Campville. They retained a few acres on the island after selling the rest in 1831, selling that small balance of acreage in 1834. From my previous research, the LaMonte family operated a ferry across the river to the island. In 1840, with her five children, Mrs. William Avery Rockefeller (the former Eliza Davison) removed from Moravia, NY to Owego, renting a house on the LaMonte farm. One of her sons, John Davison Rockefeller, Sr., 11 years old at the time, often worked for pennies a day on the LaMonte farm. Born July 8, 1839 in Richford, NY, John D. Rockefeller, world-renowned founder of Standard Oil Company, went to the Court Street Owego Academy, was tutored by Susan Jane LaMonte at her home, and often kept in touch with her on his returns to Owego as an adult. Another student of renown who taught at the Owego Academy was Benjamin F. Tracy, Secretary of the Navy under President Benjamin Harrison. The former Owego Academy at 20 Court Street is an old brick building still very much in use, nicely remodeled, repainted, and well kept over the years. It was in this Federal style building (built in 1827-28) where I began my secretarial career in 1972 as a high school senior. I worked part time, then full time after graduating high school, for Lewis B. Parmerton, Esq., gaining valuable knowledge from his experienced secretary, Kathy. My desk was at the second window to the left of the front door on the first floor, looking out on two tall buttonwood (sycamore) trees which are now gone. The basement then housed the N.Y.S. Department of Motor Vehicles where I obtained my learner’s permit and driver’s license. I will also never forget the sale of a particular old building on Front Street along the river’s edge to Pat Hansen. After all paperwork had been completed and signed, and Ms. Hansen had left, Mr. Parmerton stood in the office with us two secretaries, shaking his head, “I don’t know what she wants that old building for.” Little did he, or Kathy and I, realize then, but Pat Hansen turned her building into the extremely successful store, “Hand of Man,” spurring on the revitalization and growth of Owego’s Front Street businesses which continues to this day! I love poking around in the “Hand of Man,” enjoying the delicate and gorgeous one-of-a-kind gifts. But, among the antiques in the Parmerton office was an oil painting of the Owego Academy, with two young sycamore/buttonwood saplings which stood in front of our office windows. I cannot find a copy of this painting in an online search. The building’s tin ceilings were high and ornate. There were beautiful fireplaces, an old Seth Thomas pendulum clock, an 1850 map designating every road and building in Tioga County, and Mr. Parmerton’s office/library was lined with bookshelves filled to the high ceiling, rolling ladders needed to reach the upper shelves. The floors were wooden, uneven and squeaky in places, with a beautiful dark wood banister going up the stairs to the second level. In fact, taking the stairs to the upper floor, I had occasion to enter the office of two elderly attorneys, the Beck sisters. I remember Rowena Beck, the first woman lawyer in Tioga County. The sisters’ grandfather was Professor Joseph Raff who, in 1875, composed the Blue Tassel Quadrille for the start of a new season on the Great Island. Of further interest, Sedore notes that Raff was the brother of Joachim Raff, an accomplished orchestral composer, who just happened to be “a personal friend of Franz Liszt and Hans von Bulow.” (Sedore, p.23) Small world indeed! Little did I then know the history I was working amongst! The Owego Steamboat Company had its first boat ready by the end of February 1874. The “Owego” was 75 feet long, 26 feet wide, capable of carrying 200 passengers. Unfortunately, she did not have the most auspicious start to her career. Putting the “Owego” into the river with 20 men aboard on April 6th was the easy part. All too soon, however, they realized her paddlewheels were too light and frequently simply stopped moving. But, that was easy enough to rectify – a man lay down on top of each wheel house, pushing the paddle wheels with his hands to keep them working! What a job that must’ve been! Having finally gotten the “Owego” into deeper water, things only went downhill from there. As they tried to bring her back to shore, someone misjudged and she stopped with a sudden thud on hitting the embankment. This sent several of the men sprawling flat out on the deck. Deciding to take the flatboat to shore (towed behind for emergency situations), the men got safely onto this small boat – only to find it couldn’t handle their weight, and it promptly sank. With chagrin, their only option left was swimming to shore, likely glad it was the middle of the night with few fans around to observe the indignity of it all. Over the ensuing nearly 20 years, the Hiawatha House hotel was built and eventually expanded to three stories with a dance hall, restaurant, and honeymoon suites, with its front balconies overlooking the river. Gravel strolling paths were made, with small “arbors” built along the paths to sell confections, cigars and lemonade. Games were played on the lawns of the island, and scull races were held on the river. Clam bakes were also quite popular, as was the dancing held until the early morning hours, keeping the steamboat busy at the dock. Many businesses and churches from local and numerous outlying communities soon found it a popular picnic destination spot over the years. In 1875, a new and better dock was built. It was 75 feet long with thirteen 16-foot-long piles driven to a depth of 10-1/2 feet. Sedore comments that nine of these original piles are still visible when the river level is down. This was another boom year for the island. In September, the “Owego” was sold with plans in the works for a new steamboat, the “Lyman Truman,” bigger and better at 120 feet long. She was launched March 9, 1876 from the riverbank just west of the Owego bridge, taking far longer to do so than expected. She broke the ropes as she lurched forward, gliding about a mile downstream before being stopped and held in place. Her engine and boiler were not yet completed; sadly, these, too, met with misfortune. The day before the “Lyman Truman’s” launching, the boiler exploded while being tested in a machine shop on Hawley Street in Binghamton. Parts flew upward and outward, some landing 500 feet away, another part embedded itself into the roadway, severing a gas pipe with noxious fumes filling the air. Two people were killed instantly, a third soon died from his injuries, and ten others received various light to severe injuries. By mid May, the “Lyman Truman” had a new boiler in place, just in time for the island’s full season. This was 1876, our nation’s centennial year, and celebrations were being held everywhere, with the island no exception. A great loss, however, was the passing of “Old Joe” in April, but the island’s summer calendar moved forward. The Hiawatha House hotel had just had its third floor added and was ready for the grand opening on June 7th of Hiawatha Grove on the Big Island. About 2000 people came for the July 4th centennial celebrations on the island. Even with a brief heavy shower, everyone was in high spirits. The Declaration of Independence was read along with prayer, a song, and a lengthy speech. Croquet and various lawn games were played, and bands provided music for dancing couples, along with a great deal of delicious food being consumed by those enjoying the day’s events. In August 1887, Cyrenus LaMonte sold the Big Island, now known as Hiawatha Island, to Dr. S. Andral Kilmer and Company of Binghamton who later sold his half to his brother, Jonas M. Kilmer, in 1892. Apparently, Kilmer had stated he hoped to build a sanitarium on the island. Though the 1888 season was a great success, the island was never again used as a summer resort. The Big Island’s greatest days were unexpectedly silenced forever. The Kilmers made no announcements or promises for opening the 1889 season. The steamboats were leased or sold. Boats were not allowed to dock at the island by the Kilmers, and no one was allowed entrance to the island to observe how their work was coming on the new sanitarium. “The 1889 season came and went without the usual excursions to Hiawatha House and the grove. There was no dancing, bowling or billiards. Hiawatha was closed to the public.” (Sedore, p.111) Though small groups were occasionally allowed entrance to the hotel, the demise of the island’s success was obvious. Instead, the Kilmer family used it as their private family retreat. Sedore includes an 1890 photo of the Hiawatha House (Sedore, p.121, fig.32). Near the dock at the river’s edge, she stood tall, an elegant lady in white, an impressive four stories, with first and second floor balconies, and fourth floor dormers. In 1900, the island was sold by Jonas Kilmer, and a succession of various owners filed through the property in the ensuing decades. Hiawatha House was taken down in 1932 after falling into disrepair as other outbuildings either burned or collapsed with age. Aerial photos from 1900, 1937, and 1955 show how few trees remained on the island. From the highways today, it’s hard to tell what the interior of the island looks like beyond its border of trees along the river’s edge. It has been used during the 20th century for private family retreats and camping to dairy farming. I also recall that Hiawatha Island went on the auction block on August 20, 1988 following financial difficulties by its then current owner. Inquiries about purchasing the island came from Japan and the Arab countries, with an ad in the Boston Globe bringing ten phone calls in two days. Having heard a local land developer intended to purchase the island to strip-mine it, the Historic Owego Marketplace, Inc., also known as the Hiawatha Purchase Committee (a non-profit group of Owego business people), decided to purchase the island to protect it. They barely managed the successful bid at $351,000; yet, with a 10% buyer’s premium, the total purchase price was $386,100. Ultimately, the final cost was over $700,000 with interest payments and other expenses. Numerous people, volunteers, and businesses came together to help raise funds to pay off the purchase price, an accomplishment many thought impossible. A good number of fundraisers were held, with Noel “Paul” Stokey (of Peter, Paul and Mary fame) coming to town to give a concert. After four years, the fundraising group was able to pay back those who had kindly loaned money to the purchase committee. An annual “Walk Through Time” was held on the island along with a Native American Pow-wow. When the Hiawatha Purchase Committee paid off their debt for the purchase in 1993, they turned their ownership over to the Waterman Conservation Education Center in Apalachin for perpetual conservation. The purchase committee insisted on restrictions to keep the island in a natural state forever, and that the name would always be Hiawatha Island. Waterman Center’s director, Scott MacDonald, has said, “From a naturalist’s standpoint, we preserved a very unique piece of land for the community. It truly is the ‘jewel’ of the river.” (Life in the Finger Lakes.com) “The Waterman Center plans to use the island for education classes on Native American civilizations, conservation, wildlife, and perhaps archeology.” (Sedore, p.220) In 2006, a family of bald eagles was actually spotted living on this now-protected island! And, I’m sure that many more eagles have made the island their home since then. What a legacy the Hiawatha Purchase Committee has left us for the future. In allowing the island to rest without commercial traffic, its use strictly limited under conservation guidelines, this gem of the Susquehanna once again shines in its natural state. BOOK SOURCE: Hiawatha Island: Jewel of the Susquehanna by Emma M. Sedore, pub. Tioga County Historical Society, March 1, 1994. Previous entry It's Laundry Day!